Expectations, what are they? How do they influence our personal growth? Expectations are terrible, terrible things, unless you learn how to manage them. How do we manage expectations, well first you define them. So everyone you meet in your life is going to place some sort of expectation on you. There is no way to get around it. From the minute you’re born, your parents already have hopes and dreams of what they think you should become. You’re friends want certain things from you, your spouse, your children, your boss. Everyone has needs and as humans we expect these needs to be met, and when they aren’t, conflict arises. The important thing is that you figure out what those expectations are, and define them in your own words. Understanding what others expect from you can make communication much simpler. You can choose to conform to the expectations placed upon you, ignore them, or meet somewhere in the middle. Relationships of any kind have expectations, some are verbalized, some aren’t. Often in my experience it’s those non-communicated expectations that cause the most trouble. Your wife cooks dinner every night. For a week you don’t wash the dishes (hey football is on), then one day she slams the pan on the stove and lashes out: “WHY DONT YOU EVER HELP ME?! WHY DO I HAVE TO DO EVERYTHING. ” You may look at her kinda funny, then think ugh she’s a little crazy today. She’s not crazy, she is just expecting you to do something and in her mind you are FAILING. A simple expectations like washing a dish or two, now in the moment turns into you FAILING at EVERYTHING. Is she crazy? Are you failing? Or has she failed to communications her expectations? (Caution: the answer maybe both. She could very well be crazy and have a communication problem), but that is beside the point. Every night you have homework. Every night your mom asks, “do you have homework today?” That question prompts a response and an expectation. If you answer yes, then the expectation is that you will complete your assignment. One night Mom doesn’t ask. Later that night at 10pm you whip out those math problems and all of a sudden your mom’s gone CRAZY. Why are you doing homework at 10pm!!! Why is mom losing it? Because there was an expectation that you are to do your homework immediately upon getting home from school. In order to minimize the crazy – TALK about what others expect from you and what YOU expect from them. Expectations should always be communicated. When I want someone to do something, I ask them. Easy right? We as women sometimes have it in our heads that our expectations are magically going to be understood by our children, our spouses , our friends …..well sorry they aren’t. Don’t expect someone to know what you mean.. or what you want. Over communicate your desires and you will find they are much more manageable and more likely to become a reality. Communicating also gives the other person time to respond and act (if they choose to do so). Maybe your boyfriend doesn’t want to take the dogs out every morning. Maybe he just wants to sleep in one Saturday. Do you sense resentment from him? TALK ABOUT IT. Giving the other person a chance to respond to an assumed expectation also limits the crazy. Besides no one wants the crazy in their life! 3. Always give yourself expectations. Now, it is so easy to focus on someone else rather than ourselves. Ever find yourself surrounded by a bunch of women? All they talk about is how they saw someone do something that they would never do. oh my god, *gasp* I would neverrrrr……fill in the blank Having expectations for others is easy. Having and meeting expectations for yourself is difficult. My own definition of an expectation: something that is suppose to be met. I remind myself everyday about the things I want to accomplish. The expectations we set for ourselves should be THE MOST IMPORTANT ONES. No one else is going to live our lives for us, or suffer the consequences for our actions. Anyways, I don’t know about you, but I feel devastated when I struggle to meet my goals….. Which brings me to the next point. Give yourself and others realistic expectations. OK…So your hubby doesn’t wash dishes every night or volunteer to vacuum (EVER), but maybe he does get up at 6am to walk the dogs every morning. Allowing you to sleep in (YEAH THAT’S RIGHT…..what a sweetie). Reevaluate your expectations of others constantly. What you wanted before may not be the same anymore. Maybe in the past the expectation was that your boyfriend holds your hand every time you walk down the street, but now you’d rather just walk next to him — communicate that, so that when he goes to reach for your hand you aren’t apt to pull it away. (For some reason I have a lot of hand holding stories, odd). It sounds silly but, you’d be surprised how many things we fight about or get angry about when all in all we just didn’t communicate our expectations or reassess what’s important to us. 5. You can’t always meet them. That’s ok.
We all know someone who is very needy with our time. We all have that person who expects us to spend every moment of free time with them or dedicated to a particular project. Maybe this person has communicated this expectation “I’d really like to see you, I’d really like to spend time with you, I really wish you’d make time for me.” There. The expectation is communicated, understood and defined. Well, maybe you just don’t have the time. That’s okay. Learning to manage expectations is a life saving/relationship saving skill. As soon as you know that you won’t be able to meet that expectation, communicate it, and don’t beat yourself up over it. Honesty is the best policy right? So be upfront, honest, and straight to the point. If you are struggling to maintain your sanity while juggling work deadlines, a relationship, family, school, and friends — trying to meet everyone’s expectations is going to make you crazy. So don’t. Meet your expectations, and just communicate to the other parties what your limits are. 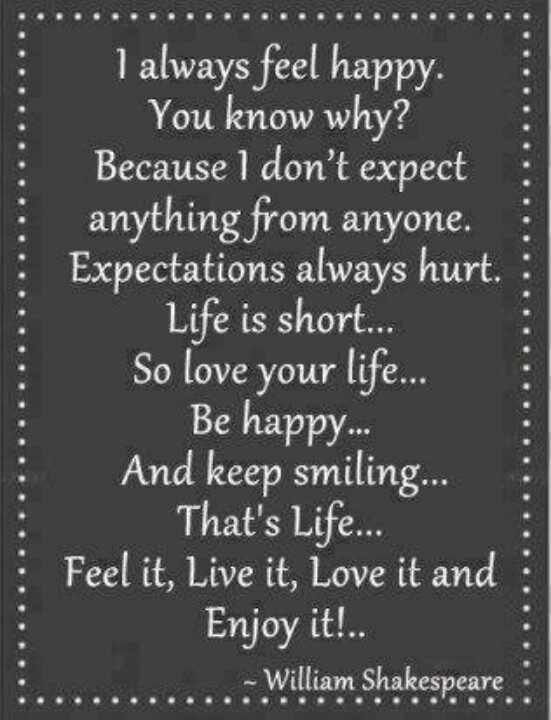 My number one expectation in life is to be happy. So sometimes people have to wait, i might return a phone call the next day, my computer gets shutdown for the night and I try again the next day. Sometimes sanity is my expectation for the day. Survival. And that’s good enough for me. ← When did it become wrong…. to be wrong?